I got a used Launchpad Mini MkI today and it's the same problem here. Sending Midi from Ableton works, from Axoloti not. I tried to do a test run with the Launchpad since it's only Midi Notes I have to check with that one but I get the Buffer overflow all the time, also when I set the Lfo really slow. 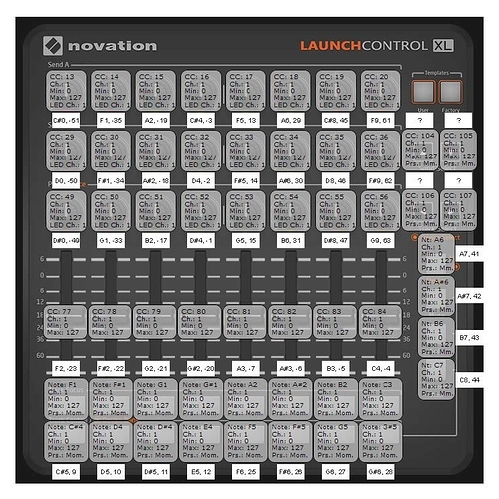 The creator mentions that for the Novation launch series devices have "special support". Maybe a hint that they react differently on Midi input then other controllers? hmm, well same company, so perhaps same issue? it also seems something about your device/usb cable etc is not right. on my virus I can sent the whole sequence at 200+hz (+64 lfo) and I dont get any buffer overruns. so you will be able to test this when 1.0.9 is released. OK Thanks for taking the time solve this problem! sorry, this is up to @johannes, and I think we are a bit 'stuck', both he and I are pretty busy, and yet there are a couple of known issues, that should be fixed before it makes sense to release 1.0.9. as ideally 1.0.9 should be a 'release candidate'. I'm getting the lightshow now with 1.0.9! Thank you very much guys great work! @Blindsmyth I cannot have led feedback on nanokontrol 2. can you explain it to me with a little bit of more detail? Thanks! 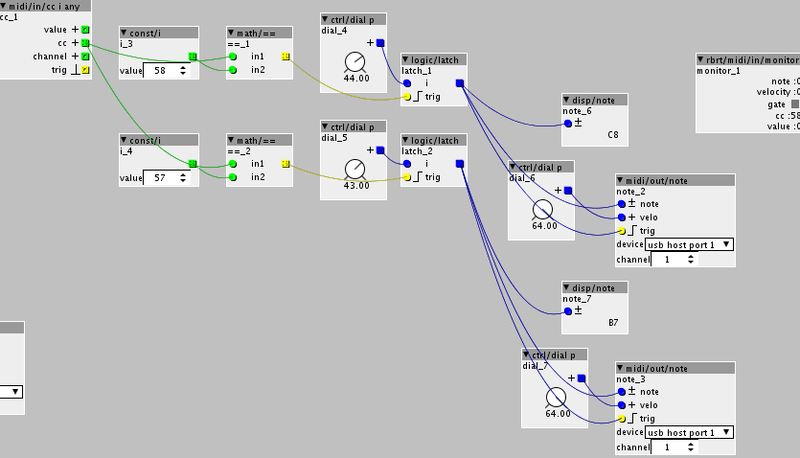 you do led feedback by sending back the same midi notes/cc that the corresponding buttons transmit. I can really recomend vel send 4 by rbrt for notes. the nanokontrol buttons will need a velocity above 0 to light up. I cannot get it... I don't know why, but it doesn't work. Can you post an image? thanks! 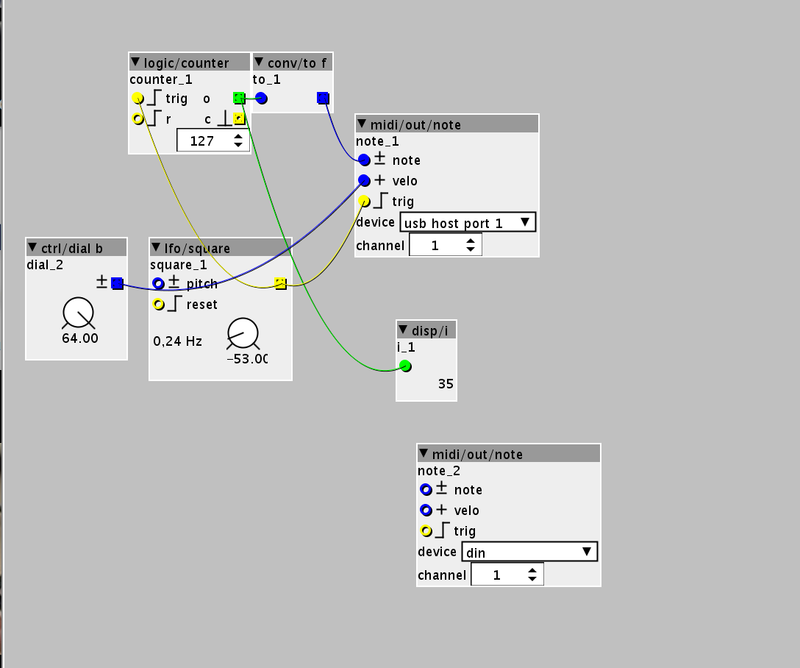 The thing is that you have to download the KORG editor and set the leds for be controlled from "external". After you send the CC number that correspond to the led you want to light and send 127 of velocity, and thats it. 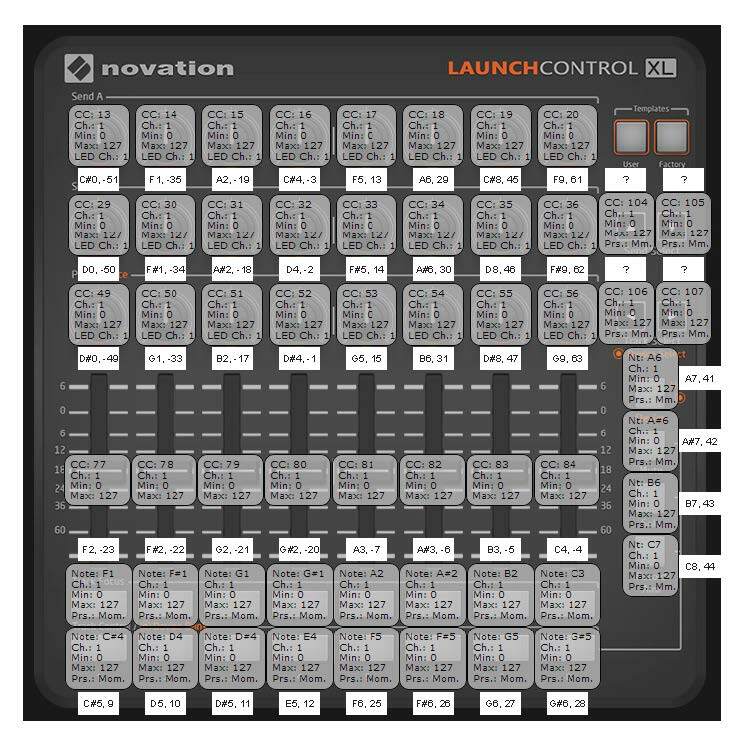 I tried to do this on my launchcontrol XL, but I never get the LED to lit. I'm getting two cc in to trig the corresponding note to lit the SOLO and RECORD ARM button. I need a visual feedback of the switches on my patch. @Blindsmyth can you tell me how you managed it to work? Why did you connect the trig inputs of objects 'note_2' and 'note_3' to 'blue' signals ? Maybe you should rather connect them to the "==1" and "==2" objects. I changed that but it didn't change anything. I think you could benefit from using tables. You should probably check some of rbrts objects for this. Its along time since I tried it but it made it alot easier to work and didnt need to many objects. Usb host midi output ringbuffer overflow? Yes as jaffa pointed out @rbrt has created an amazing collection of objects for dealing with midi in/out, tables and feedback. In your case the velsend is nice. Try this it should work on user factory mode 1 if you change the midi channel to 9. The thing with buttons is they correspond with the note/cc value they send. In this case solo is note 107 and record arm 108 which translates to axoloti values of 43 and 44 (as in the example @SmashedTransistors posted. p.s. the table is not needed but can be helpful if you want lots of toggles with your midi buttons.